MOSCOW, Russia -- International monitors say they have spotted a new kind of Russian weapons system in rebel-held Ukraine this week, possible evidence of Moscow's continued interest in Ukraine even as it focuses on Syria. 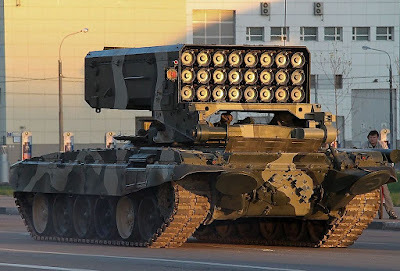 The TOS-1 'Buratino,' or 'Heavy Flamethrower System,' is a feared weapon -- a 220 mm multiple-launch rocket system (MLRS) which fires thermobaric rockets. These rockets are designed to literally light the air on fire, generating intense heat and flame but also burning all of the oxygen out of an area. This makes them extremely effective against buildings, bunkers and fortifications, and lightly-armored vehicles since it can easily kill people inside enclosed spaces. The Organization for Security and Co-operation in Europe, which is monitoring a ceasefire in eastern Ukraine, reported that its monitors had seen a mobile TOS-1 'Buratino' weapons system for the first time. The Buratino is equipped with thermobaric warheads which spread a flammable liquid around a target and then ignite it. It can destroy several city blocks in one strike and cause indiscriminate damage. Only Russia produces the system and it was not exported to Ukraine before the conflict broke out, according to IHS Jane's Group and the Stockholm International Peace Research Institute, which track arms exports. The OSCE's findings are embarrassing for the Kremlin, which has turned down its rhetoric on Ukraine and shifted attention to Syria, where it has begun air strikes. The report comes before President Vladimir Putin holds talks in Paris on Friday with the leaders of Germany, France and Ukraine on the peace process. The Russian defense ministry did not reply to written questions from Reuters about whether Ukrainian rebels were supplied with the weapon or where it had been exported. Russia denies its military is even in Ukraine. But there have been numerous signs that Moscow backed the rebels with troops and equipment. Reporters spotted two burnt-out tanks last year which military experts identified as Russian army tanks in rebel-held territory. Alexander Hug, deputy chief monitor of the OSCE monitoring mission to Ukraine, told Reuters by phone monitors had spotted the Buratino at a rebel training area in the village of Kruhlyk. "We saw the weapon on that training ground," Hug said. "Both sides agreed a year ago to withdraw heavy weaponry from the line of contact. Having them near the line of contact is of course a concern as this weapon should be in storage and not be used." Hug said the weapons system was "indiscriminate and very destructive." The Popular Mechanics website called TOS-1 "hell on earth" for anyone it targeted. According to IHS Jane's and the Stockholm Institute's unofficial arms transfers database, Russia has only exported the system to Azerbaijan, Iraq and Kazakhstan. Ukraine said it did not possess the Buratino. "We have not got them and we have never had it in service," Vladislav Seleznyov, a spokesman for the Ukrainian military, said. "The Russian army has it. It was used against us in the area of Donetsk airport." The Ukrainian defense ministry said on its website in March that the separatists had used seven TOS-1 Buratino systems and that one of them had been destroyed by its forces. Fighting between Ukrainian government forces and the separatists in Ukraine's eastern Donetsk and Luhansk regions has killed more than 8,000 people since it flared in mid-April 2014. But violence has ebbed in recent weeks to its lowest level since a ceasefire was signed in February, even though Western diplomats say the 12-point peace plan is far from fulfilled. Rebel leaders this week signed an agreement to extend a withdrawal of weapons to include tanks and smaller weapons systems. A rebel representative said on Wednesday the agreement could mean an end to the conflict.